South Portland’s South Waterfront is officially the new home of the remnants of the battleship USS Oregon. 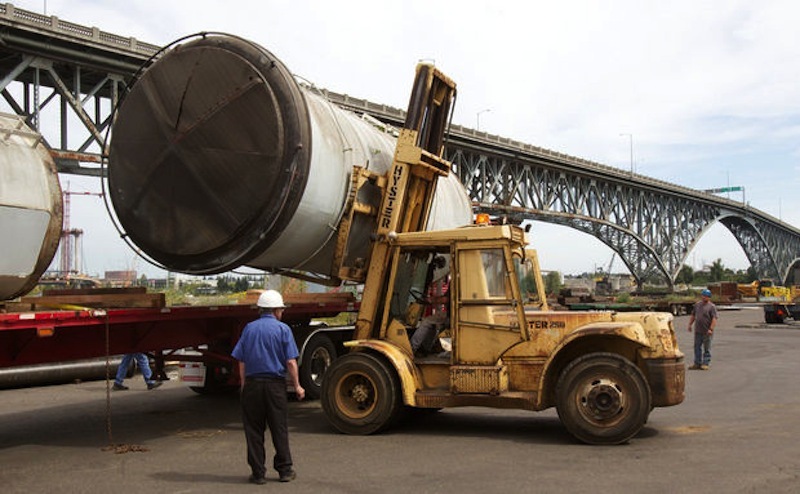 Also known as the “Bulldog of the Navy,” the remnants of USS Oregon were moved from the Port of Portland to a new storage site at Zidell Yards. USS Oregon is a 11,688-ton Indiana class battleship. In late 1898, USS Oregon, a coal-powered ship considered the fastest and deadliest of its time went to the Far East for the first of two tours of duty that lasted until 1906 there, when she returned to the U.S. west coast. From 1906 to 1917, she served occasionally in the eastern Pacific. During the First World War, she guarded the Pacific coast and escorted a troop convoy to Siberia. She was decommissioned in 1919 and loaned to the State of Oregon as a museum ship in 1925. She was later reclassified IX-22. During World War II, she was sacrificed for the scrap steel effort, but her hull was retained as an ammunition barge and towed to Guam in 1944. She was finally sold for scrapping in 1956. Decades later, she was placed in museums. She first went to a Portland museum near the Broadway Bridge as the centerpiece of the 1925 Rose Festival. Later she was moved south of the Hawthorne Bridge as a tourist attraction. Now, her remains—her mast, smokestacks, and giant anchor and chain—are being stored in Zidell Yards. Two 9,900-pound, two-story smokestacks that served as memorials on the waterfront for 15 years will stay in the yard. These smokestacks were moved to make room for condominiums in 2005, but now Oregon Maritime Museum supporters are working to make the smokestacks into an exhibit. When the Port of Portland told the museum they had to move the smokestacks, Zidell Yards volunteered to store the artifacts. The artifacts were moved by Emmert International, a Clackamas-based heavy haul transportation company. They are now envisioning a display on the waterfront between the Marquam and Ross Island bridges. So the ship’s military foremast was removed from the waterfront park?